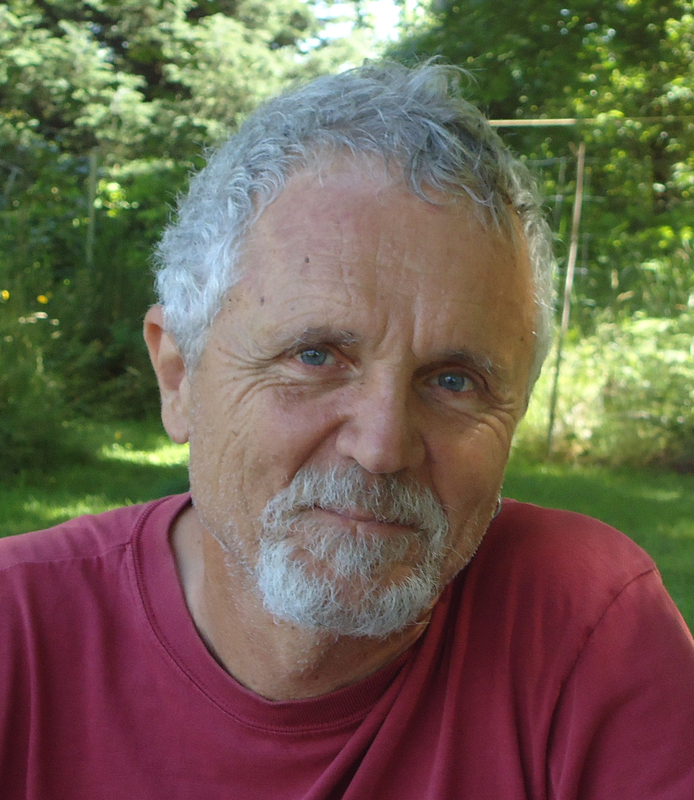 An interview with Dr. Thierry Vrain: A former genetic engineer speaks out about GMOs. On a warm, sunny day in May, underneath the shade of cherry blossoms, my partner Paul and I sat with Thierry Vrain, a former scientist who worked for Agriculture Canada for 35 years. Part of his job was to serve as the designated scientist to address public groups to reassure them that genetically engineered crops and foods were safe. After retiring 10 years ago, he reversed that position. Even though I was eager to hear a scientist’s perspective, I was feeling out of my comfort zone. Although we study science during our school years, many of us live our lives without applying scientific knowledge in our everyday lives. A few years ago, I had forced myself to concentrate on the scientific explanations of GMO technology written in the book Seeds of Deception by researcher Jeffrey Smith which told about the beginnings of GMO research. With this interview, I was given the opportunity to hear about genetic engineering as applied to our food supply, and to pass on what I learned for all of us. Since we all eat for a living, we have a responsibility to understand how our food is produced. I started by asking Dr. Vrain if there was a pivotal event or specific piece of information that led to him changing his position on the safety of GMO agriculture. He explained that after retiring from being a soil biologist, he became an organic farmer and began learning things about soil biology not taught even in graduate school. Now, he not only had the time to read different perspectives, but also the freedom to think differently, which led to experiencing a gradual awakening to the possibility that genetic engineering ‘was not all rosy and perfect’. He is now a passionate speaker about organic gardening, from soil health to the devastating effects of GMOs. The story of GMO researcher Dr. Arpad Pusztai is valuable in order to understand the world of scientific researchers. Dr. Pusztai, one of Europe’s top toxicologists at the prestigious Rowett Institute in Aberdeen, Scotland, received a very large grant to design a protocol to test GMO crops for the EU. His research on rats fed GM potatoes (which were already selling in the US as early as 1995) showed that many systems in the rats’ bodies were adversely affected. On Aug. 10th, 1998, a UK television show aired a 150-second interview about his findings. The next day he was suspended after 35 years of service, silenced with a threat of a lawsuit. According to Dr. Vrain, Dr. Pusztai had committed the mortal sin, in the scientific world, of going public before publishing his results, before his peers could review his science. So he was instantly fired, his lab was closed, he had a gag order and could not publish, his data was confiscated and a commission of government experts decided his results were not valid. However, several months later, he was invited by the UK Parliament to testify. His story spread quickly across Europe, resulting in public distrust of GMO technology. Dr. Vrain started by explaining that the cells of every living organism consist of basically three major kinds of molecules: carbohydrates (made by plants through photosynthesis from sunlight) lipids, and proteins. The carbs and lipids do not move, but the proteins do, so they do the work. ‘Every molecule of protein can twitch, can make a movement, and that twitch can do something… that molecule can twitch another molecule and can do something in the cell… that’s what proteins do.’ Essentially, they make life happen because life involves movement. So the genetic scientist’s intention is to engineer a protein in the plant to do something new in the plant, for example, insect resistance. Since he was a soil biologist, I asked him if there was any effect from GMO crops on the soil itself. The answer involves understanding how a GMO plant is created. A new gene with a specific trait is inserted in plants, for example, to make a protein that would kill insects. During the engineering process, an antibiotic resistance gene is engineered into the plant as well. The outcome on the soil is basically that ‘every single engineered plant on the planet today has antibiotic resistance gene in it. That gene is in the genome, it’s in the roots, it’s in the soil and that can be picked up by the bacteria in the soil’. This is all happening globally on several hundred million acres of farmland planted with GMO crops. Then he told us about a publication from the University of Schezuan, China, where researchers have shown that every river they sampled contained antibiotic resistance genes that in all probability came from the local transgenic crops. He also mentioned that in the case of Roundup (Monsanto’s herbicide) it too has an adverse effect on the soil, because it is a chelator: it holds manganese, magnesium and a few other minerals, and by holding and not letting go, it basically starves the plant. He touched on the probability that other creatures in the soil are starved in the same way, but since it is not documented, we cannot say for certain. I was appreciating the importance of scientists publishing their data. I wanted to know how a genetically engineered plant was considered ‘substantially equivalent’ to a conventional plant, since to my mind, if DNA has been altered, the plant is different. He explained how a scientist can hold a different view of nature. He asked us to imagine if by adding a human gene to corn, we could have 10,000 acres of corn growing insulin, and wouldn’t that kind of progress be very good? So if a tomato plant has a bacterial gene, and the fruit still looks and tastes like a tomato, to a scientist it is still a tomato plant, and therefore, the principle of substantial equivalence seemed natural to describe the genetically altered plant. I asked Dr. Vrain to tell us about the Human Genome Project, completed in 2002, with the goal of sequencing the whole genome of a person. He explained that before this research, the science of molecular biology was based on the theory that the human body functions with about 100,000 proteins. It has been known that DNA codes for proteins. So it was believed that each protein is coded for by one gene. Thus, if there are 100,000 proteins in our body, then there should be 100,000 genes. However, the Human Genome Project concluded we have only just over 20,000 genes in our body. Suddenly, the one gene, one protein hypothesis no longer applied. It was an old paradigm. After all, science is based on observation. We might learn something today that changes what we knew yesterday. This means that scientific fact may never be certain, and here was a perfect example. Scientists also discovered that the genome of any living organism is actually a very complex eco-system where 95% of the DNA is actually full of sequences regulating the other 5%. It used to be that the function of the 95% of DNA was unknown and it used to be called ‘junk DNA’! A gene is basically shot into the plant, with the goal of making a protein that creates specific new traits in the plant. But Dr. Vrain admitted that the scientist has absolutely NO control over where the gene will show up in the genome. This inserted gene doesn’t really belong there, and now functions according to regulatory sequences it is not normally regulated by. No one really can predict what the gene is going to express! The conclusion is starkly clear: genetic engineering is an imprecise technology. We then learned of a number of studies showing that engineered plants have truncated proteins that are quite different than the proteins expected by the scientists, that are aptly called rogue proteins, and, that they have not been investigated. To hear that scientists have let loose some rogue proteins into the environment, which go into our bodies, felt like a stunningly laissez-faire attitude regarding potential dangers of an unprecedented technology. And still more troubling information emerged in our conversation. According to the old dogma, if you put in a gene, you get the protein you want. Period. To test for the safety of genetically engineered crops, the criteria called for proving that the protein inserted in the plant is safe, that it produces no adverse effects. So how did scientists test for safety? We were told they started with the pure protein, meaning they tested it in a laboratory. They did not look for the protein IN the plant to see its effects on the plant or its environment. In this way, any unintended consequences are excluded from consideration. So how was the decision made that the protein was safe? He said scientists ‘assumed’ that if the desired protein was inserted, it would get the effect they wanted. By using the old ‘one gene one protein’ paradigm, the process of applying the principle of substantial equivalence seemed obvious. I found myself questioning if the future of the planet is based on commercially convenient assumptions. Do GMO advocates still believe the old paradigm? The answer was yes. He explained that if scientists start questioning that there may be more than one protein in the plant other than the protein intended, that would make the plant different and not substantially equivalent, and that would necessitate testing. He then told us that since 1996 the regulatory agencies have waived responsibility, saying ‘it’s completely substantially equivalent, there are no differences, we do not even need to look at them, and the companies don’t need to do any research’. I was curious if Dr. Vrain was still in touch with any of his colleagues since becoming an industry whistleblower, and he said no, that when their pay-cheque depends on a specific point of view, scientists continue to ignore major sources of information. It was fascinating to hear the inside story of how scientists function. Dr. Vrain explained that when he started out, he was given a lab, a technical assistant, and a small budget and that ‘the game was play in the lab and make sure you publish, and the more you publish, the better’. This modus operandi he called ‘Publish or Perish’. But about 25 years ago, in the late ‘80s, a significant change occurred. Scientists were allowed, and even encouraged, to seek corporate funding. ‘The more outside money you could have, the more industry was interested in your project. That was a sign that you were doing good work and you were getting extra funding so you could have a bigger lab.’ A lot of money went to molecular biology back then. He continued: ‘Not only that… if you were good and successful and you hit on a really good project, you could patent. So from Publish or Perish we went to Patent and Get Rich’. It follows that if a scientist publishes results not acceptable to the scientific dogma or the corporate line, then their funding will dry up. Apparently even scientific exploration operates according to ‘Follow the Money’ principles. I brought up the Occupy Movement and how it hit a chord with the disenfranchised 99%, that big companies are making the rules, and regarding agriculture specifically, that biotech companies are not allowing independent studies of GMOs. So we all agreed that concerned citizens must keep making noise about faulty studies and problems of GMO agriculture. I brought up the continuous battles to prevent the introduction of GMO alfalfa, which farmers definitively do not want, and the non-browning apple, which he said began in his lab when he worked in Summerland. It was apple country, and ‘someone got the bright idea to silence the gene that browns the apple’. But the growers are against it, and the organic farmers are up in arms. It reminded me of something David Suzuki said: Just because we can do something, doesn’t mean we should do it. Surely we must make some noise to prevent the non-browning apple from becoming a reality. My partner Paul decided to make valuable use of our time with a scientist, and asked about terminator technology, in which the seed or pollen becomes infertile. Do terminator genes pollinate, and is it possible to pass on infertility? The response was a frightening yes, that is why so many people are concerned about it. Monsanto did buy the technology, the thinking being that if seeds were infertile, people would be forced to buy their seed. ‘We are talking famine here’ he said, because infertility can spread. Certainly the seriousness of this issue demands that we make a lot of noise if Monsanto ever brings this idea out again. As we reached the end of a very sobering conversation, our former scientist mentioned a 120 page study released in June of 2012 called GMO Myths and Truths, put together by a genetic engineer and an investigative journalist in the UK. This is a very important document, a compilation of articles and government reports that question the safety of GMOs, and is easily available online. It takes courage and strength to let go of preconceived ideas and accept new data. Psychologists call it cognitive dissonance. Spiritual teachers refer to the letting go as disillusionment. Dr.Thierry Vrain has faced this most humbling human experience with dignity and grace. But regarding the safety of our food supply, we are all being humbled now. Although we would prefer to trust that our food is safe, the realization is hitting us that the facts show otherwise. It is clear to the millions who marched against Monsanto recently that GMO technology is absolutely not the way to feed the world, and that we have a duty to resist Big Biotech’s techno/chemical war against nature. The way to feed the world, as peasant farmers worldwide know, is to create and support small sustainable farms, working with nature. 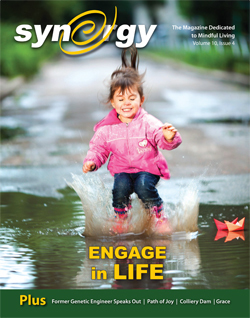 We, at Synergy, would like to thank Tsiporah and express our appreciation for her going ‘above and beyond’ as she volunteered her time to travel, interview and write this article for Synergy Magazine! This entry was posted on Friday, July 12th, 2013 at 10:04 am	and is filed under FEATURE. You can follow any responses to this entry through the RSS 2.0 feed. You can leave a response, or trackback from your own site.